Ah, what a relief it is! That old cliche truly applies to how I feel now that I have successfully completed the National Breathe Center (NBC) treatment program for my problem. As a long term, over 20 year sufferer of bad breathe, I truly feel “liberated” of my problem now that I know what causes halitosis and how it can be cured. Dr. Miller and his staff hygienists, Bri and Kanesha, are true professionals, extremely competent, very knowledgeable in oral hygiene problems and issues, and above all, the techniques and methods to resolve the problem. During the process of my Cure, I learned a lot from the NBC staff about daily, weekly, and monthly good oral hygiene maintenance. 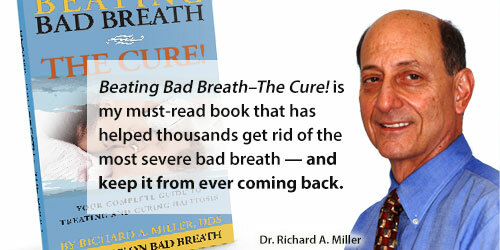 These are the required steps that help maintain long lasting freedom from the monster of bad breathe. I assure you I will follow the protocol faithfully henceforth. As a local resident living not too far from the NBC office, I regret not having discovered Dr. Miller and staff years earlier. But now I am a happy man thanks to the NBC! Keep up the good work and I will surely recommend you in the future.